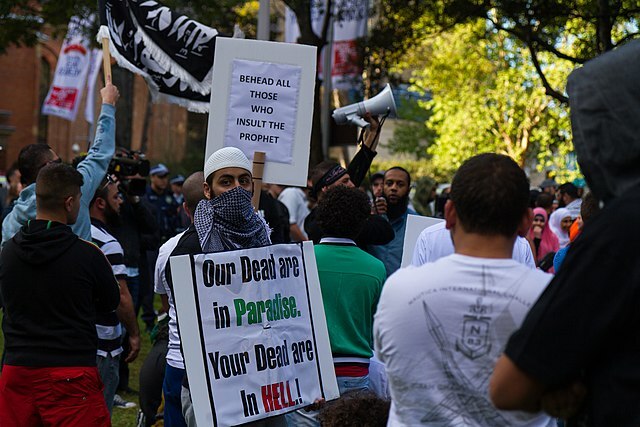 English: Muslim protesters carry signs reading "Behead all those who insult the Prophet" and "Our dead are in Paradise. Your dead are in HELL!" Photograph taken at 2012 Sydney protest against the film Innocence of Muslims. This image was originally posted to Flickr by *Jezza at https://www.flickr.com/photos/49283475@N00/7991807923. It was reviewed on 18 September 2012 by FlickreviewR and was confirmed to be licensed under the terms of the cc-by-2.0. Our dead are in Paradise. Your dead are in HELL!